This door phone supports two-way voice communication and remote door release function. Unlock door with IOS/Android devices (IPhone, IPad and other smart phones). You can watch, hear and speak to the person in front of your door and unlock the door with your smart phone, no matter where you are or what you are doing. - Made of quality material, it is waterproof and practiacl. - Support both wired network and wireless WiFi connection. 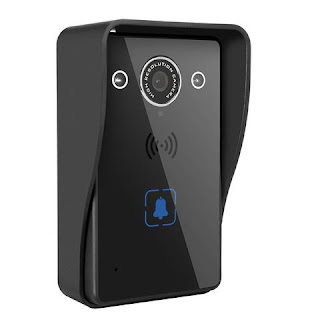 - Remote control function, you can see and speak to anyone in front of your doorbell by your smart phone, tablet or PC, and unlock the door. One door phone can be connected to 5 devices.